COLUMBUS , Ohio â Tiny plastic fibers could be the key to some diverse technologies in the future -- including self-cleaning surfaces, transparent electronics, and biomedical tools that manipulate strands of DNA. 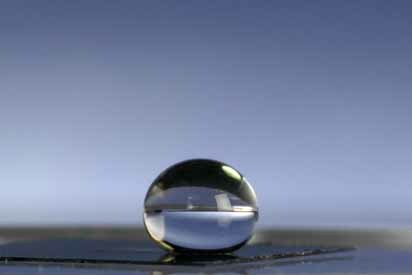 In the June issue of the journal Nature Nanotechnology, Ohio State University researchers describe how they created surfaces that, seen with the eye, look as flat and transparent as a sheet of glass. But seen up close, the surfaces are actually carpeted with tiny fibers. The patent-pending technology involves a method for growing a bed of fibers of a specific length, and using chemical treatments to tailor the fibers' properties, explained Arthur J. Epstein, Distinguished University Professor of chemistry and physics and director of the university's Institute for Magnetic and Electronic Polymers. "One of the good things about working with these polymers is that you're able to structure them in many different ways," Epstein said. "Plus, we found that we can coat almost any surface with these fibers." For this study, the scientists grew fibers of different heights and diameters, and were able to modify the fibers' molecular structures by exposing them to different chemicals. They devised one treatment that made the fibers attract water, and another that made the fibers repel water. They found they could also make the surfaces attract or repel oil. Depending on what polymer they start with, the fibers can also be made to conduct electricity. The ability to tailor the properties of the fibers opens the surface to many different applications, he said. Since dirt, water, and oil don't stick to the repellant fibers, windows coated with them would stay cleaner longer. In contrast, the attracting fibers would make a good anti-fog coating, because they pull at water droplets and cause them to spread out flat on the surface. What's more, researchers found that the attracting surface does the same thing to coiled-up strands of DNA. When they put droplets of water containing DNA on the fibers, the strands uncoiled and hung suspended from the fibers like clotheslines. Epstein said scientists could use the fibers as a platform to study how DNA interacts with other molecules. They could also use the spread-out DNA to build new nanostructures. "We're very excited about where this kind of development can take us," he added. Epstein's research centers on polymers that conduct electricity, and light up or change color. Depending on the choice of polymer, the nano-fiber surface can also conduct electricity. The researchers were able to use the surface to charge an organic light-emitting device -- a find that could pave the way for transparent plastic electronics. Finally, they also showed that the fibers could be used to control the flow of water in microfluidic devices --- a specialty of study co-author L. James Lee, professor of chemical and biomolecular engineering and head of Ohio State's Center for Affordable Nanoengineering of Polymeric Biomedical Devices. Lee and Epstein are advisors to former graduate student Nan-Rong Chiou, who developed the technology to earn his doctorate. He is now a visiting scholar at the university. Other co-authors on the paper included former doctoral students Chunmeng Lu and Jingjiao Guan. The technology is a merger of two different chemical processes for growing polymer molecules: one grows tiny dots of polymer "seeds" on a flat surface, and the other grows vertical fibers out from the top of the seeds. The fibers grow until the scientists cut off the chemical reaction, forming a carpet of uniform height. The university will license the technology, and Epstein and his colleagues are looking for new applications for it. Aside from anti-fog windows, self-cleaning windows, and organic LEDs, Chiou said that he foresees the surfaces working in glucose sensors, gene therapy devices, artificial muscles, field emission displays, and electromagnetic interference shielding. This research was partially funded by the National Science Foundation.